What will we call the boat? But it needs two names. 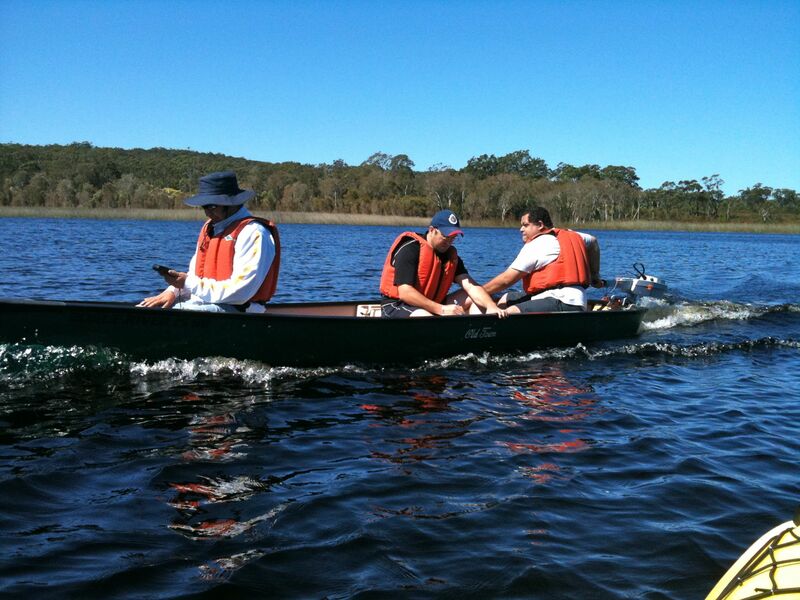 What about Green Bunyip because the research work is green and the boat is green? What about the Spanish for green? 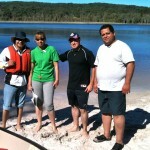 – that will make a nice symbolic link between Australia and Mexico. 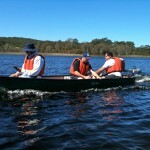 We name this canoe Bunyip Verde. 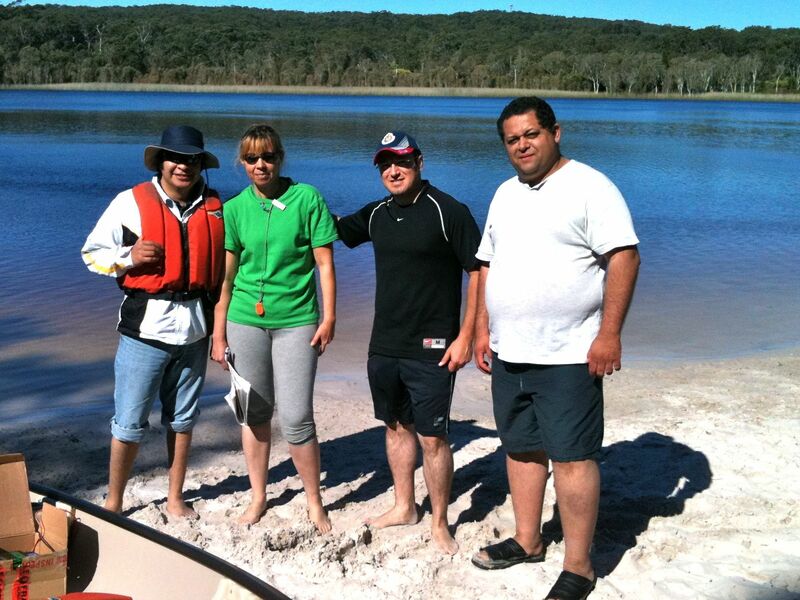 These visitors from Universidad Tecnologica De La Zona Metropolitana De Guadalajara are researching alternative means of propulsion for fisherman on Lake Chapala that is the water supply for Guadalahara, Mexico’s second largest city. The fishermen now use petrol outboards and soon they may longer be permitted to use them because they compromise the water quality. 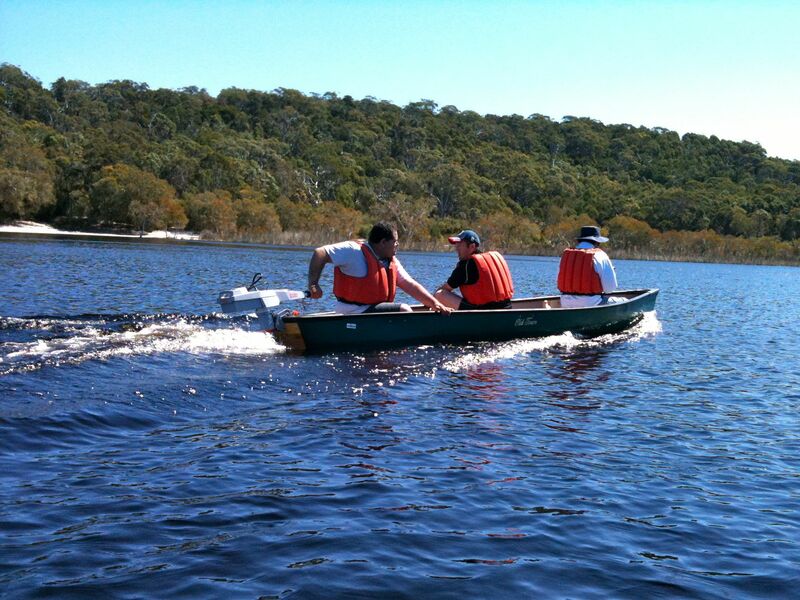 So in conjunction with Dr Peter Davey of Griffith University they came to Brown Lake at Stradbroke Island to run some tests on Torqeedo outboards and a large canoe. I happened to be on Straddie and was invited to contribute because of my experience with powering Torqeedo outboards from the sun. And Claude was here to provide technical advice about setting up and use of the Torqeedoes. Testing was done using the Travel 1003 and the Travel 801 with an external battery. Top speed with the Travel 1003 was a momentary 12.6 km/hr and that was perhaps wind assisted. 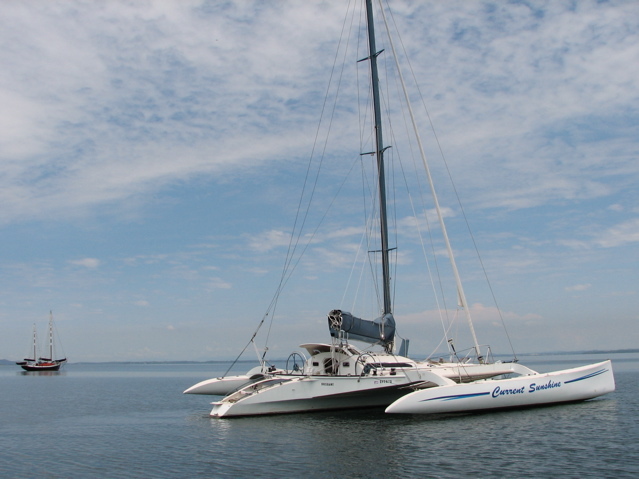 A speed of around 11 km/hr was a repeatable top speed in the light winds of mostly around 5 knots but sometimes as much as 10-12 knots. After about two hours of test runs the battery level was at 5% so the testing was switched to the Travel 801 which is able to be used with its integrated battery or an external battery. 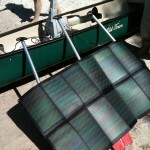 In the meantime it gave us an opportunity to use the CIGS solar charger to recharge the battery from the sun. To begin with it was laid flat on the ground and using a clamp meter we could see that 1 amp was being delivered to the battery. 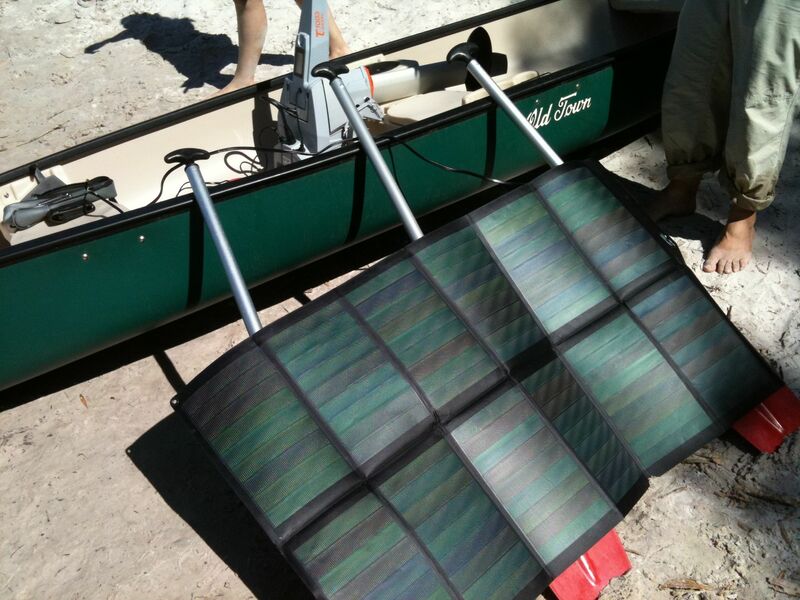 Then we experimented with using paddles laid on the canoe so that it faced the sun and that improved the output to as much as 2.1 amps. That was about the best we saw and when the canoe was needed for more testing we used tree roots and fallen branches to conjure up a suitable platform for the panel. The battery was on charge for two hours from 11.55am to 2.55pm and in that time the charge status rose from 5% to 24%. Testing continued using the integrated battery of the 801 as well as an external Lithium battery from LiFeTech batteries. The external battery was a 30ah capacity at 24v which gives it almost double the capacity of the built in battery of the 1003, and about 2 and half times the range of the 801 battery. In the tests though the 801 integrated battery ran out of power earlier than expected even though we understood it to be fully charged. Unfortunately the history of this battery was not well known so we couldn’t speculate on the reason of for the low capacity. 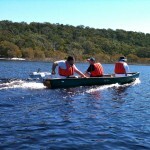 The canoe is a an Old Town design from Good Time in Brisbane and the researchers were very pleased with its stability and load carrying capacity. 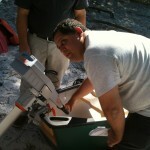 Most tests were done with three on board and the total weight of the crew and gear and was around 280 kg. The fishermen use traditional wooden boats of a design more suited to bringing home a big catch than being easily driven. So one of the aspects of this research is to recommend a suitable boat design that could combine an sleek hull, which is important for getting maximum range from the power available in the batteries, with the good load carrying capacity that the fishermen need. It is fantastic to see great international collaboration towards sustainable solutions! Viva Australia! Viva Mexico! 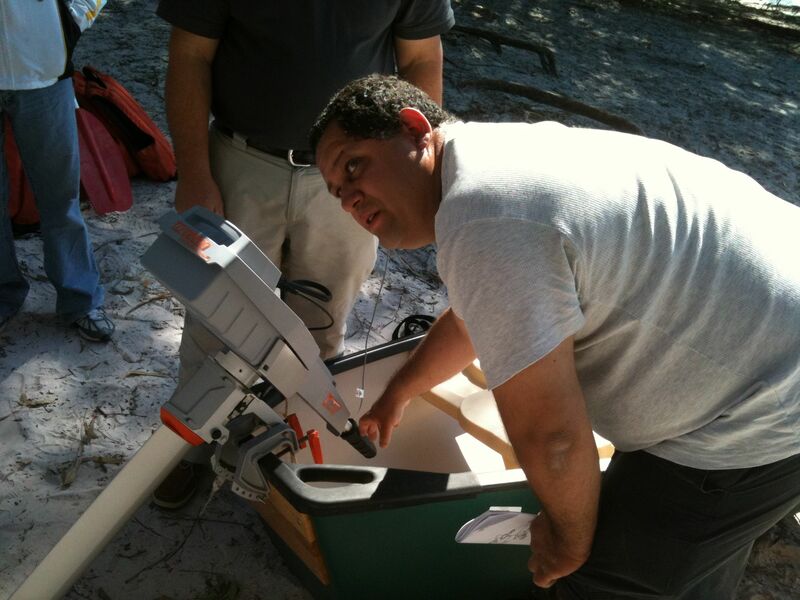 Great research weekend…we are planning to test this equipment on Lake Chapala in Mexico on 27 and 28 November 2010…we’ll report back on the results using the same electric motors and solar panels on the local fishing boats.